There are many headlights, but none of them have the fierce styling as the Sun Ray. 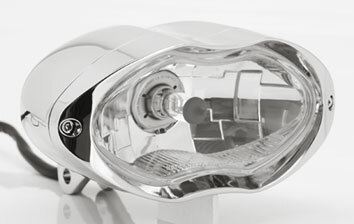 Headlight is 7 1/2" (19 cm) wide, 3 5/8" (9.3 cm) high and 7 1/4" (18.5 cm) long. It has a clear DOT approved lens and diamond cut reflector and comes pre-wired and with a 12 Volt 55/60 Watt H4 halogen bulb installed. The Sun Ray headlight can be used in all bottom mount applications. Available in chrome or black at your Zodiac dealer.